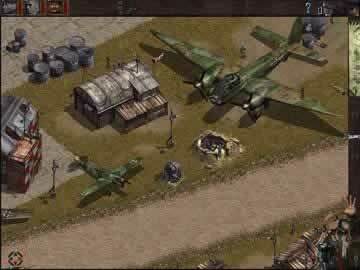 Commandos Beyond the Call of Duty Game Review - Download and Play Free Version! The Enemy is Bringing the Firepower - Are You? You're in charge of the six elite soldiers again as they dare to finish what they started! Armed with new extreme weapons and decoys, the boys are heading to Eastern Europe, Greece and Germany to take down the enemy! But they better watch out because the Germans are ready to greet them with Panzer and Luftwaffe reinforcements. Can you get your soldiers behind enemy lines to bring destruction to the enemy? This expansion pack for Commandos: Behind Enemy Lines introduces eight new, intense missions. View the opening cutscenes and the first mission completed to get a feel for the game. Sneak in and attack the enemy! Sabotage aircraft and destroy train-mounted artillery! A unique twist is that the commandos can capture hostages and use them to distract enemies. 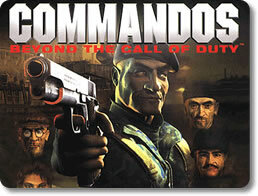 The commandos can also distract enemies by tossing stones or packs of cigarettes. This game will keep you busy with new weapons, buildings, vehicles, two new characters, unique environments like a zoo and two difficulty levels. Both shooter veterans and new recruits can enjoy these tough new missions. These missions are very challenging and packed with intense action and good military background music to make the experience realistic. Strategize and plan the perfect battle approach, coordinate attacks and distractions, sneak and snipe-you choose how to play. You can even grab some friends and play multiplayer mode. Don't let the enemy get the better of you! Play Commandos: Beyond the Call of Duty now and show 'em what your soldiers are made of! 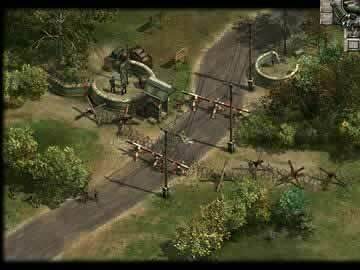 Commandos: Beyond the Call of Duty is a real-time strategy war game that brings back the intense tactical combat that this series is known for. The gameplay cleverly combines strategy, puzzle, and action elements as you try to overthrow the German war machine and bring an end to the war. You once again get to take control of a squad of specially trained commandos, each with their own unique abilities, and this time there is even a new team member the Seductress. Using each character's special skills, such as the Sniper's scope shot or the Marine's underwater abilities, really add to the strategic depth of the gameplay and it is quite interesting how you can combine them in order to complete the difficult missions ahead of you. One new feature that is rather nice is that now every commando can throw a rock or a pack of cigarettes to distract enemies and can force captured Nazis to do their bidding as long as they stay within range of their sidearm, which is very helpful. The levels themselves are also well rendered with eye-catching details and great graphics. There are some negative sides to this sequel though which may be too much for some gamers. For starters, the game is quite a bit shorter than previous titles with only 8 levels. Also, the missions are very difficult to the point where it seems like completing them is just as much about luck as your finesse. Previous games in this series were difficult, to be sure, but they were at a manageable level where you could be patient and usually figure a way to overcome the obstacles, while this title is missing that feel and presents many situations that seem impossible. It also doesn't help that the interface doesn't lend itself well to multi-tasking as you must micro-manage your commandos and they tend to be a little slow in reacting to your commands. So, it can be quite challenging to coordinate an attack on the relatively large troop formations that are on patrols within most levels. This all adds together to create some pretty frustrating moments early on in the game. Overall, Commandos: Beyond the Call of Duty continues the series intense real-time strategic action and throws in some new interesting features. The gameplay difficulty definitely hinders the approachability of this title to new players, but should be enough to test the more experienced players and fans of this series. While there are several problems with this sequel, it does provide much of the same addicting gameplay of the original and is definitely worth at least giving it a try.